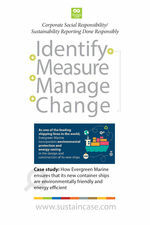 As one of the leading shipping lines in the world, with a service network that connects five continents through 315 business locations in 114 countries and a fleet of approximately 200 container ships with 1 million TEU of cargo space, Evergreen Marine incorporates environmental protection and energy-saving in the design and construction of its new ships, committed to ship management practices that reduce pollution at sea, to the air or on land. When it comes to the design and construction of its new ships Evergreen Marine not only considers future operating costs, but also environmental protection and energy-saving. 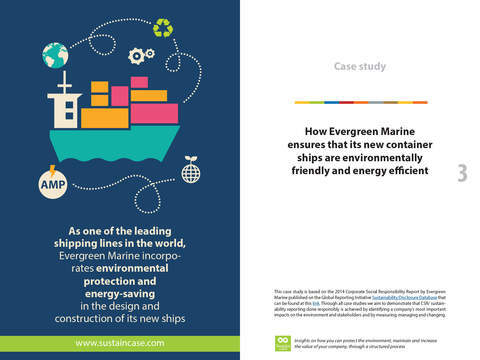 These are incorporated into planning and design at the start of construction, so that new ships – such as the new L-type container ships built for Evergreen Marine in 2014 – will deliver exceptional energy-saving and environmental protection performance when they eventually enter service. 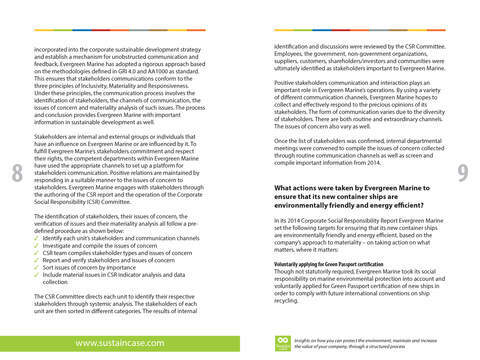 After measuring and setting targets, Evergreen Marine took action to voluntarily apply for Green Passport certification of new ships, reduce oil spill risk, comply with NOx Tier III emission regulations, prevent air pollution through Alternative Maritime Power (AMP), prevent water pollution through ballast water treatment equipment and gray water holding tanks and, also, use a variety of energy-saving designs.